Cruising around Costco one day, I spotted the large containers of spices and noticed the prices…Holy Herbs, this stuff was cheap in large quantities! I bought a 24 oz. 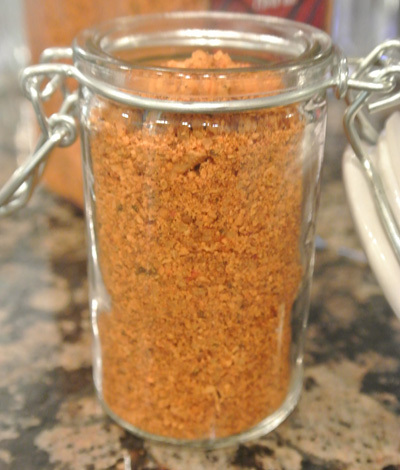 jar of taco seasoning for about $5.50 which will be a great savings, considering one 1 oz. packet of the stuff is $1-$1.29. The jar contains the equivalent of 24 packets, so do the math. This in mind, DD [darling daughter] and I came up with an easy and inexpensive party favor. 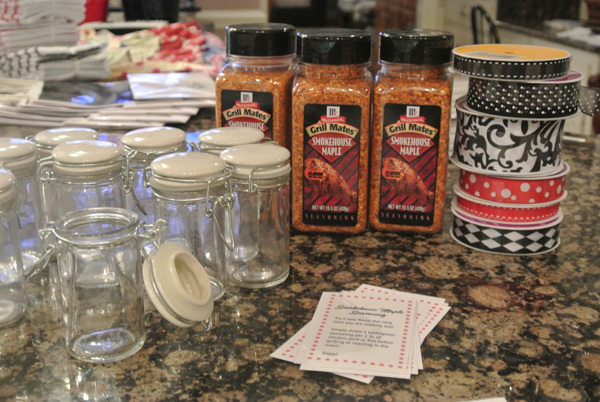 This was a casual deck christening party and the favors were for both men and women so DD chose the Smokehouse Maple Grill Mates seasoning made by McCormick. Sounded so good! 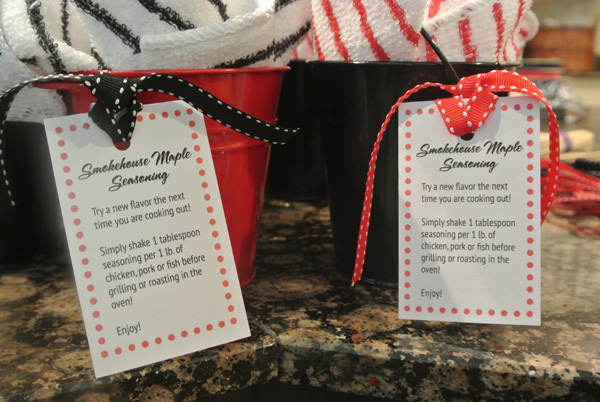 It had universal appeal and the grill seasoning matched the outdoor party theme. 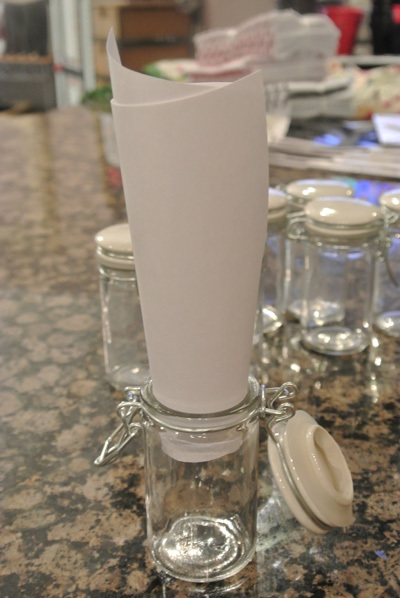 I found the perfect little spice jars at Hobby Lobby for $1.99. I could even paint on the ceramic tops if I wanted to. When I checked out I found out they were on sale for $1! Even better! I love Hobby Lobby. I grabbed some ribbon when I was there too, also on sale for 50% off. I love to keep a big stock of all kinds of ribbon, so handy for and wrapping and styling, and last minute gifts. 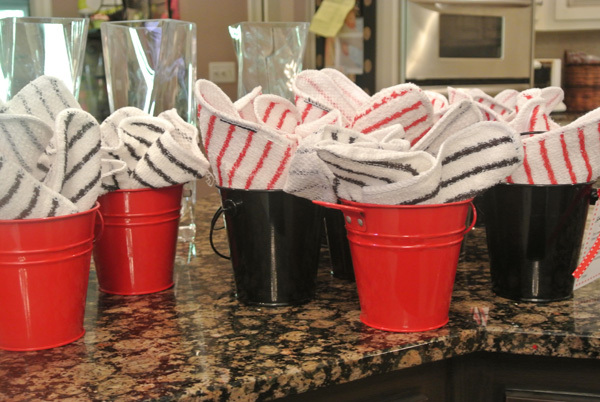 At Target I picked up these cute little red and black pails, $1 and the kitchen wash cloths, 5 for $4, which were the perfect size for the pails. Then I tucked the jar down into the scrubby dish cloth in the pail. 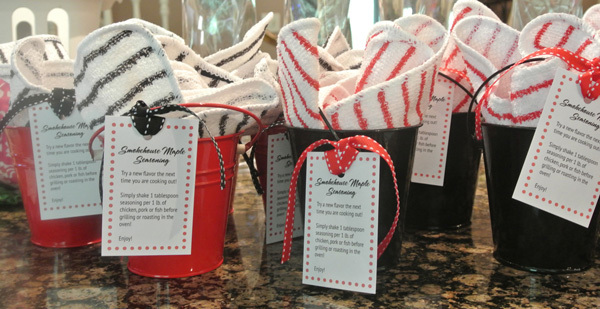 The towel was great because it not only was decorative and theme appropriate, but it cushioned the glass jar so the favor could easily be transported home by the guests. Gifts from the kitchen are always so lovely. The seasoning sounds good:@) Hope all is well, take care! Jenna, what a great party favor or hostess gift. Cute and tasty! Take care of yourself! This is such an adorable idea!! I absolutely love that you used a spice that was already made and you just had to make it look cute. Hope you are doing ok, friend! I love this idea Jenna, my mind is running fast and I know just the party for it! Thanks so much for sharing this awesome post! Hope you are having a great day. Best party favor idea ever! I’m going to definitely use this one in the future! 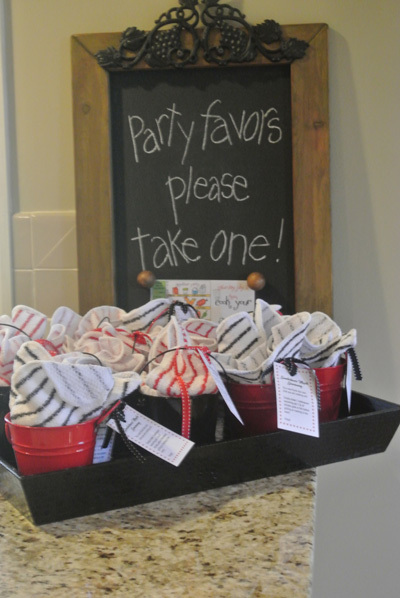 Adorable, I remember this cute and affordable party favor idea Jenna! I hope you’re enjoying some R&R as you deal with ‘life stuff’! Hugs to you… hope all is well. What a great party gift!